OpenCritic Now Flagging Games with Loot Boxes | Nerd Much? Back in late 2017, EA shook the video game landscape when they released the microtransaction riddled Star Wars Battlefront 2 and felt the wrath of the internet because of it. Fans finally had enough of the gouging mechanic and vocally pushed back. Now a year plus later, the site has made good on their word. OpenCritic published an announcement today declaring that from now forward, they will be labeling games on their site that incorporate microtransactions. And they even go as far as breaking down in what way the practice is used. 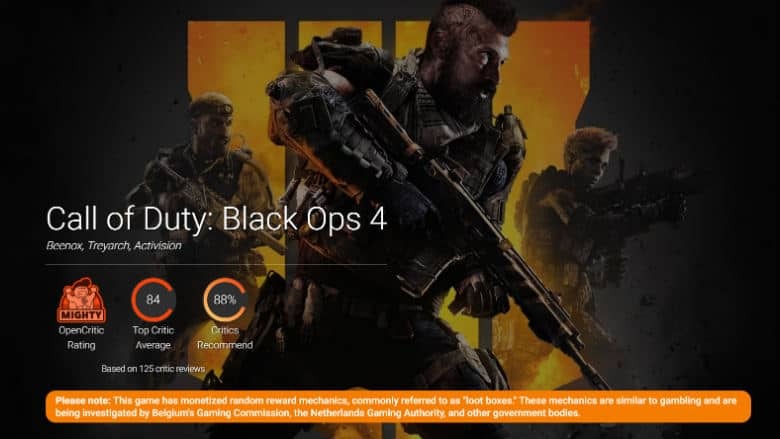 Titles specifically mentioned as being flagged for containing loot boxes include Call of Duty: Black Ops 4, FIFA 19, NBA 2K19, Injustice 2 and Overwatch. But there are many others you’ll find with the designation across OpenCritic’s site. The team at OpenCritic states that “It’s our mission to help gamers make informed decisions when considering a purchase or download. We feel that informing consumers about the presence of loot boxes is a key part of our mission.” Hopefully, changes such as this will lead to wider spread acknowledgment of the practice across the industry as a whole. You can follow us on Opencritic here.